It is indeed a colorful festival which is held in the Matho Monastery. 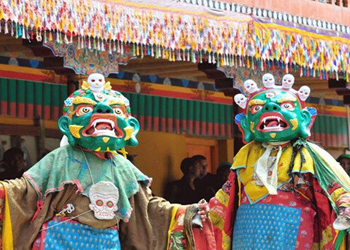 On the first two days of the celebrations for the Matho Nagrang, the monks give a splendid performance of mask dances. They wear colorful and vibrant silk brocaded robes and masks that reflect the faces of many Gods and Goddesses. The popularity and fame of this festival lies in the fact that after two whole months of dedicated mediation in absolute isolation, two oracles appear. They come to the monastery and accompany the masked monk dancers. These oracles also predict the future events. There are people who come from near and far to seek some advice from the oracles and perform certain rituals to handle disasters and other unpleasant happenings. These oracles come in complete spiritual trance after their isolated meditation. They run and jump from a balcony to the other and involve in quite a few acrobatics, all with their eyes blindfolded. All these spectacles can be witnessed during the Matho Nagrang. The Matho Nagrang is celebrated on the 15th day of the first month of the Tibetan calendar. This festival in Ladakh is held at the Matho Monastery which is the only monastery belonging to the Sakya School of Tibetan Buddhism.